Across the galaxy, smugglers and spies slip through Imperial blockades. Some deliver vital supplies to the Rebellion. Others just want to make enough credits to keep their ships flying. No matter their motivation, these rogues and scoundrels represent a defiant threat to the Empire and the Imperial Navy will stop at nothing to destroy these smugglers and their way of life. 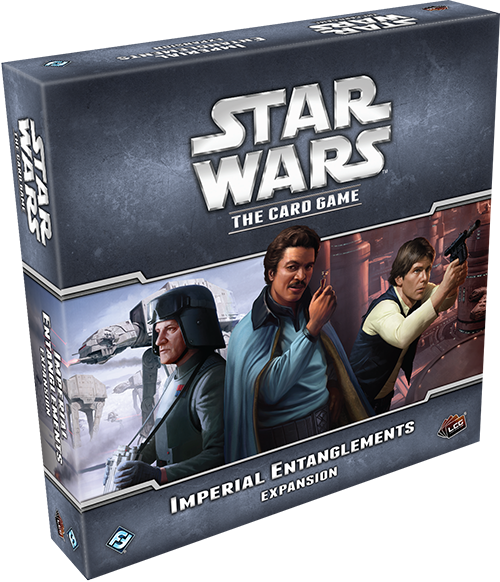 This conflict between the Imperial Navy and the Smugglers and Spies enters the spotlight in the Imperial Entanglements deluxe expansion for Star Wars™: The Card Game, but they aren’t the only affiliations that receive new cards in this expansion. Each of the four other affiliations receives a new objective set in Imperial Entanglements, and today, we’ll explore the new tactics offered to the Rebel Alliance and the Sith! The heroes’ daring rescue mission in A New Hope is one of the most memorable scenes of the movie, encompassing the desperate struggle to escape from the trash compactor and the heroic sacrifice of Obi-Wan Kenobi. Now, you can make your own Star Wars rescue missions with the Planning the Rescue objective set in Imperial Entanglements. 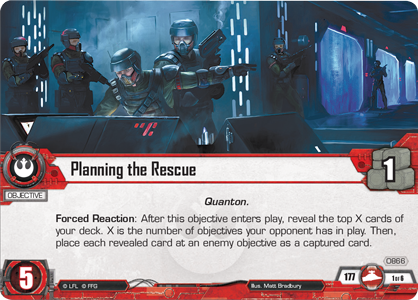 This objective set begins with Planning the Rescue (Imperial Entanglements, 866), which reads, “Forced Reaction: After this objective enters play, reveal the top X cards of your deck. X is the number of objectives your opponent has in play. Then, place each revealed card at an enemy objective as a captured card.” At face value, this Forced Reaction seems like an unfortunate turn of events for the Rebel Alliance. After all, captured cards usually only serve the purposes of the dark side. 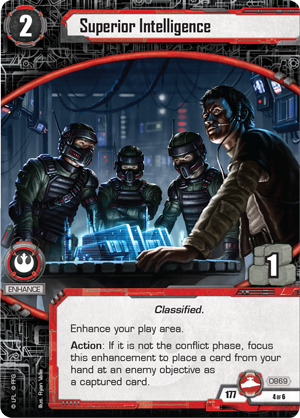 Thankfully, the Rebels have a plan, and the rest of the cards in this objective set help you put that plan into action. Your rescue plan begins with General Airen Cracken (Imperial Entanglements, 867), the head of Alliance Intelligence. 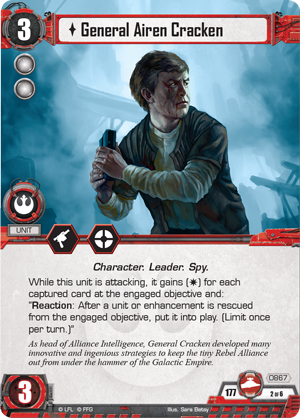 General Airen Cracken is well suited for rescue missions – he gains an edge-enabled blast damage for each captured card at the engaged objective, and if a unit or enhancement is rescued from the objective, he allows you to put it into play immediately! 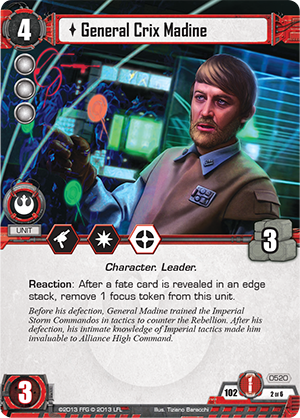 Suddenly bringing a unit like General Crix Madine (Lure of the Dark Side, 520) into play without having to spend resources can dramatically turn the battle in your favor. 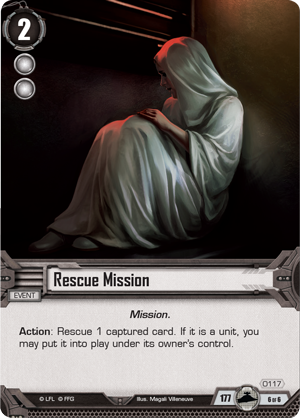 Not all dark side decks focus on capturing enemy cards, but Planning the Rescue offers more than one way to set up a successful rescue mission. 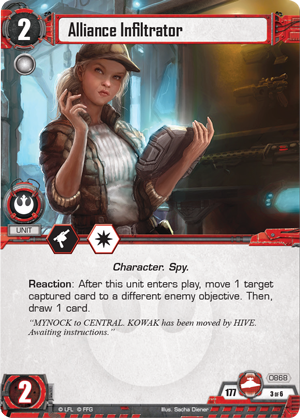 Superior Intelligence (Imperial Entanglements, 869) lets you place a card from your hand at an enemy objective as a captured card, and Undercover (Imperial Entanglements, 870) is placed at an enemy objective as a captured card after you’ve used it to shuffle two discarded cards back into your deck. 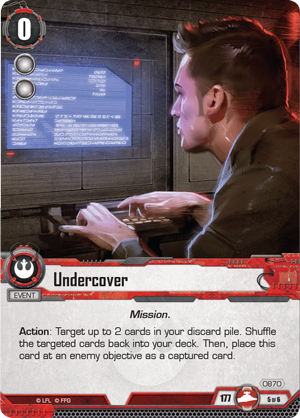 You can even arrange your rescue more carefully by moving a captured card to another objective with the help of the Alliance Infiltrator (Imperial Entanglements, 868). Of course, even a planned rescue sometimes goes wrong and units you would rather not lose can be captured. Fortunately, this objective set provides for such contingencies with a copy of Rescue Mission (Imperial Entanglements, 117). This event allows you to rescue any captured card and if that card is a unit, you may put it into play. You may even set up combos using Rescue Mission and General Airen Cracken to get your most expensive units into play for free by rescuing them! 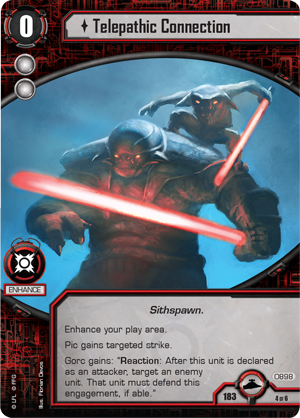 Even as the Rebel Alliance plans its daring rescue missions, you can follow the paths of the dark side with a new Sith objective set featuring the Sithspawn brothers, Gorc and Pic. Gorc (Imperial Entanglements, 896) and Pic (Imperial Entanglements, 897) were molded by the dark side of the Force into deadly fighters and Force Users, perfectly able to hold their own against the light side’s warriors. In the game, Gorc and Pic work best together. Gorc is a powerful fighter, with a high damage capacity, powerful combat icons, and the elite and protect Pic keywords. Furthermore, whenever Gorc takes damage, you may return Pic to your hand. It may seem that returning Pic to your hand permanently removes him from the fight, even if it does allow him to remove damage and focus tokens. However, Pic has an ability that reads, “Action: During an engagement in which Gorc is participating, put this unit into play from your hand as a participating unit on your side.” This ability showcases Pic’s frenetic style of combat. As long as Gorc takes damage, you can keep removing Pic from combat and re-playing him, dealing damage and focusing units across your opponent’s board. Of course, Gorc and Pic are much weaker when they’re not both on the battlefield. Fortunately, the Brothers of the Sith (Imperial Entanglements, 895) objective helps you bring them both into play. 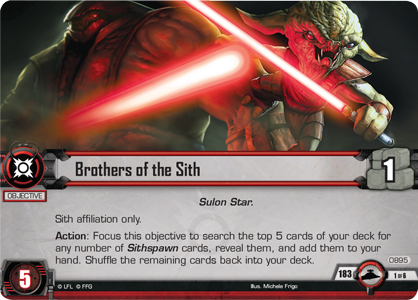 As an Action, you can focus Brothers of the Sith to search the top five cards of your deck for any number of Sithspawn cards, reveal them, and add them to your hand. If you need both Gorc and Pic to perpetrate your nefarious plans, Brothers of the Sith makes it much easier to find them. 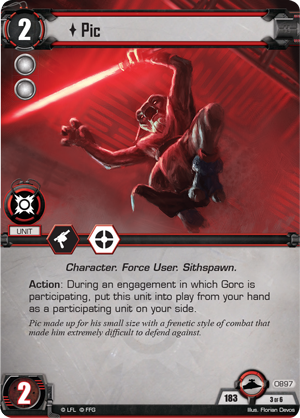 Another Sithspawn card you can find with Brothers of the Sith is Telepathic Connection (Imperial Entanglements, 898). This free enhancement makes Gorc and Pic an incomparable team. While you have Telepathic Connection in play, you can choose an enemy unit that must defend against Gorc’s attacks, allowing you to pull an enemy unit into a potentially deadly confrontation. Telepathic Connection also grants Pic the targeted strike keyword, so even after you’ve slain the units in the engagement, Pic can deal damage to units outside. Of course, some units could interfere with Gorc and Pic’s attacks. 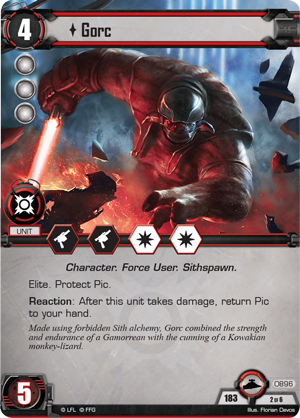 Therefore, the Brothers of the Sith objective set concludes with two powerful Force events to keep your units safe. First, you receive a copy of Force Stasis (Imperial Entanglements, 62), which allows you to choose an enemy Character or Creature unit that cannot attack or defend until the end of the phase. 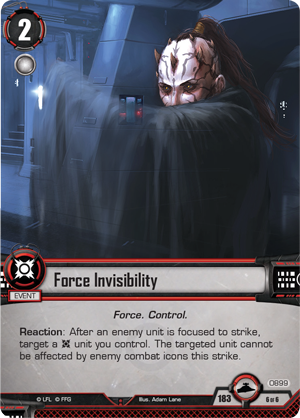 In addition, you can protect one of your Sith units from enemy combat icons with Force Invisibility (Imperial Entanglements, 899). 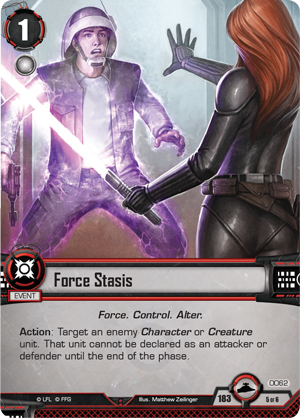 A well-timed Force Invisibility or Force Stasis could completely change the outcome of a game in the favor of the dark side. Imperial Entanglements may bring the Imperial Navy and Smugglers and Spies to the forefront, but that doesn’t mean the other affiliations are shortchanged. 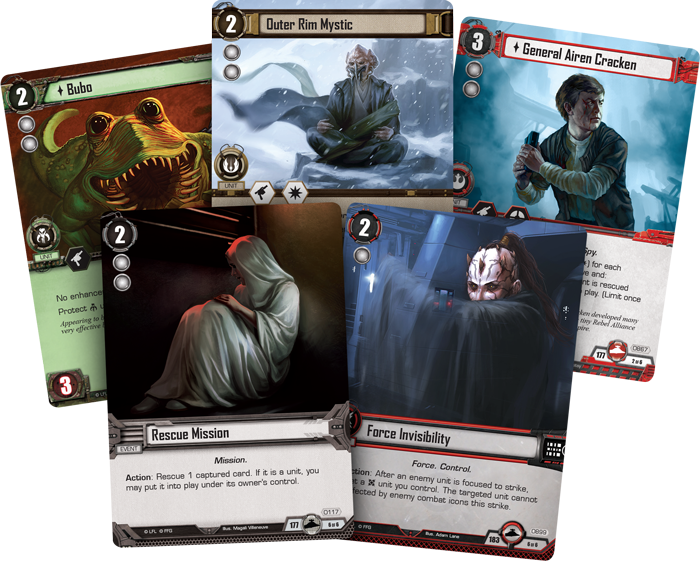 Fight for the dark or the light and enter a new era of the Galactic Civil War with this deluxe expansion! Pre-order your copy of Imperial Entanglements at your local retailer today.